Everyone in town talks about it, yet no one knows how to deal with it. The city of Scranton, bounded by mountains in Northeastern Pennsylvania and once the world’s capital of hard coal, is yearning for a new economic identity that can lead the area out of a half-decade of depression. 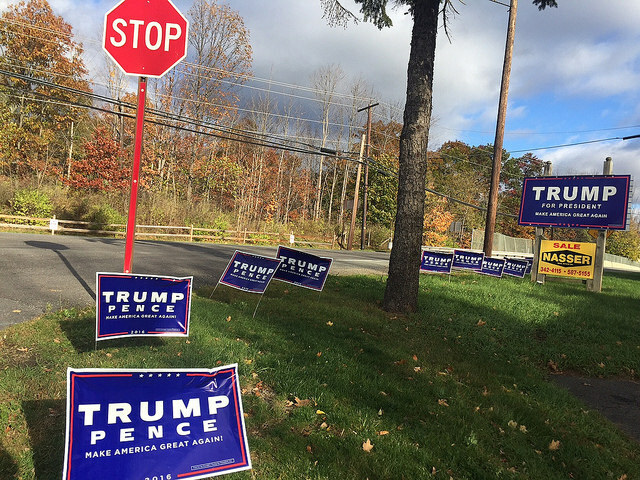 Scranton’s Trump supporters are counting down the 11 days to the election. 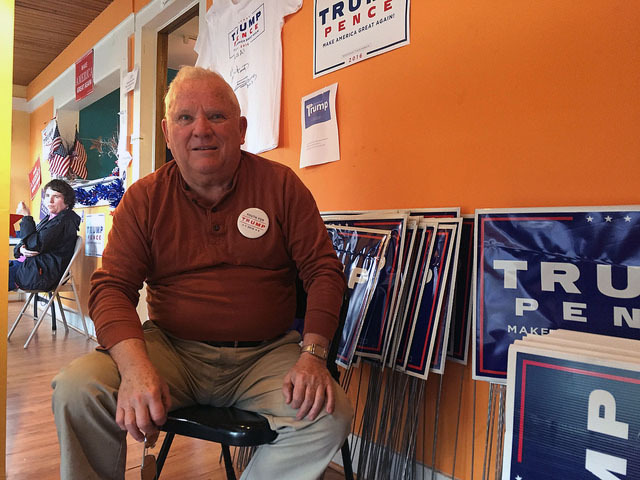 Tom Kenney, a 71-year-old Irish American who has lived in Scranton for 33 years, drove to the office with his wife and daughter to volunteer. A retired Pennsylvania state policeman, he believes that only Trump can bring jobs back and keep immigrants out. “I am your classic Trump supporter,” he said. Kenney is part of the rising Trump faction in a historically blue city. This year, 3011 registered Democrats in Lackawanna County, which includes Scranton, switched to the Republican Party, but only 502 people did the opposite, according to the Pennsylvania Department of State. Despite its heritage – the city is the birthplace of Joe Biden – Scranton is an aging, mostly white, blue-collar town. A quarter of the population sits below the poverty line. It is no surprise that it has become a contested battleground. In this campaign, both Trump and Clinton visited here twice. Scranton’s transformation into a politically split town traces back to the loss of a cherished past. The Knox Mine Disaster in 1959 flooded the mines, killing the entire hard coal industry and taking away 7,500 jobs overnight. The city has yet to recover. Its population has shrunk by half to 76,000 since 1930. The town was hit hard by the 2008 financial crisis, during which Scranton recorded the highest unemployment rate in Pennsylvania. At one point, the city was close to bankruptcy, with only $5,000 left in the bank. As jobs disappeared, an influx of immigrants fueled the anger of locals. In the past decade, more Mexicans and Asians were drawn to Scranton by the low cost of living. They now compose 11 percent of the population. The local Catholic Social Services also resettles refugees from countries like Congo, Turkey, and Syria. For Kenney, safety and security is his biggest concern, and Trump’s anti-immigrant message resonates with him. “My daughter is a young girl, I want her to be able to walk on the street and nobody is going to touch her or harm her,” he said. Scranton is one of the many American old coal towns that are struggling to form a new identity. It has been left out of the post-crisis recovery that has boosted cities like Houston and Philadelphia. Although there are plenty of empty stores and properties around town, Scranton is far from being a ghost town. A farm-to-table restaurant charging about $30 per entree was packed with patrons on a Friday evening. On the weekend, laptop-toting university students filled the tables in a hipster-style coffee shop downtown that would not be out of place in Manhattan. Local Trump supporters do not believe that the coal industry will come back, nor do they see any new industry to take its place. The government is the largest employer in Scranton, but in a small town the public sector can grow only so much. One Scranton resident and critic Gary St. Fleur, who runs a blog “Save Scranton”, claims the local government is a Ponzi scheme – using taxpayers’ money to hire more taxpayers. Trump supporters think the Republican candidate will revitalize the economy by downsizing the government, cutting taxes and putting money back into consumers’ pockets. Some residents are looking to the local natural gas industry as their next hope. Scranton is close to America’s largest deposit of shale gas, the Marcellus Shale. Its discovery drew drillers and frackers to the town three years ago, resulting in a boom in the number of local hotels. Thus, Trump supporters like the Republican candidate’s pledge to boost the energy industry. But in reality, money from fracking did not stay in town. Some residents sold their land to fracking companies at high prices and left. Those who stayed suffered from the contaminated water supply. Another potential bright spot is the healthcare industry, which hires 20 percent of the city’s workforce, according to the Greater Scranton Chamber of Commerce. With three hospitals and one medical school, Scranton is a regional healthcare hub. At the downtown Hilton, most guests visit Scranton for healthcare-related reasons, said Luke Menifee, the front office manager at the hotel. At the same time, Trump supporters are wary of Obamacare, which helped drive the growth of the American medical industry in the past six years. Regardless of which new industry takes over, the formation of a new economic identity will depend on the town’s youth and middle-aged, which constitute about 40 percent of the city’s population. But Scranton suffers from brain drain. College-educated youth prefer to leave, and hardly consider the economic development of Scranton as a priority when they vote. Sergey Gnilopyat, a 19-year-old sophomore who plans to vote for Clinton, also said the future of Scranton isn’t part of how he plans to vote. “It’s a nice little space, but not the type of space I want to spend my whole life,” he said. Those who are left behind struggle to find jobs that pay above minimum wage. Lauren Horne, a 25-year-old full-time Uber driver, hasn’t been able to find an opening for a receptionist after a year of searching. “My plan is still kind of up in the air,” she said. So is the fate of the city.